I have always been fascinated by the brilliancy of Martin Luther King Jnr. From a very early age, I bought and digested every book about him that I could lay my hands on. His eloquence, his grasp of history and his relative youthfulness (34 years when he delivered his ‘I have a Dream speech’) were all massively interesting to me. 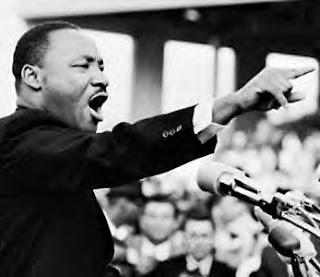 It is even more intriguing that the enduring part of the speech was unscripted - a momentous flash of brilliancy that came out of his deep passion for the cause he championed. I have watched this speech a dozen times and it has become a regular fodder for my presentation skills training programmes. I suppose what was most important for me was MLK’s deep conviction and the willingness by him and his supporters to push and suffer for what they believed. As the 50th anniversary of the speech is celebrated today and with a black man at the White House, it occurred to me that everything is indeed possible. This gives me hope for my country Nigeria. Things may look bleak at the moment; we may have visionless leaders, and our people may be enslaved to corrupt political, corporate and social elites, I can envisage Nigeria and Nigerians being free one day. What we must do in the interim, is for everyone who means well for Nigeria to keep the flame blowing by being the best teacher, the careful bus driver, the responsible employer, the diligent employee and the involved citizen wherever they are. The little step taken by each person will become the giant leap to Nigeria’s future. Secondly, it is common knowledge that freedom is hardly ever freely given, it has to be fought for; the lesson of the civil rights movement is that we must be ready to become the masters of our destiny by fighting for Nigeria’s freedom. The people who benefit from the inefficient systems of Nigeria will never willingly vacate their entrenched positions. They have become a political and economic principality and can only be shifted if and when, like MLK and his group we hold the same level of conviction and passion for change and are willing to fight for Nigeria’s freedom. Let’s fight for this freedom through hard work, responsible citizenship and never keeping quiet about the injustices in our society. Let’s fight for the freedom by holding public servants and politicians to account on social media, newspapers and most importantly with our votes. I can truly relate to what you have written here. I often reflect on things that have happened throughout history. To my knowledge, no oppressive or exploitative system has crumbled without a fight. It seems to be a dark side of humanity, but there will always be a privileged few who benefit from the suffering of many. Even the European settlers fought England for independence from unfair taxation and a government that ruled them without providing adequate representation. Yet, everything is possible. 150 short years ago the Dred Scott Decision declared Africans in America would never be citizens of the United States. However, at this same time blacks were building their futures here behind the scenes and believing in a better tomorrow they'd never live to see. I also believe in a brighter future for Nigeria (and other parts of the world). History tells me it will be so. Let's be careful about HOPE. America was founded by people who sought freedom from imperialist Britain and made it a home for all freemen. That fundamental philosophy guides everything that America does and despite the checkered history and several injustices and discrimination, this philosophy has always prevailed. The same cannot be said of Nigeria. At a point, it all boils down to what we can do for ourself and not what people can do for us. We all complain about the leaders and the chronic corruption deeply entrenched in leadership but, we are quick to forget that it's people that make leaders. Unfortunately, those that were once at the fore-front of protest get into position of power and suddenly transmutate into monsters. It all boils down to us and our actions.Once each person flee from corrupt acts of foolishness then,the world would be a better place to live in.